Download links added in November 2013! See below. Most of my research involves studies of shallow-water organisms from the Late Ordovician Period, about 455-444 million years ago. Over the years, my colleagues and I have produced a number of papers, research posters, and other media associated with this work. 1. *New* Two new guidebooks co-authored for the GAC-MAC Winnipeg 2013 meeting, are now hosted on the Manitoba Government website. One is a guide to the Ordovician-Silurian boundary interval in the Williston Basin, authored by Robert Elias and others. The other is a guide to the geology of the Manitoba Legislative Building by Young, Young, and Brisbin. Along with several other excellent geological guidebooks, the full downloads can be found here. 2. 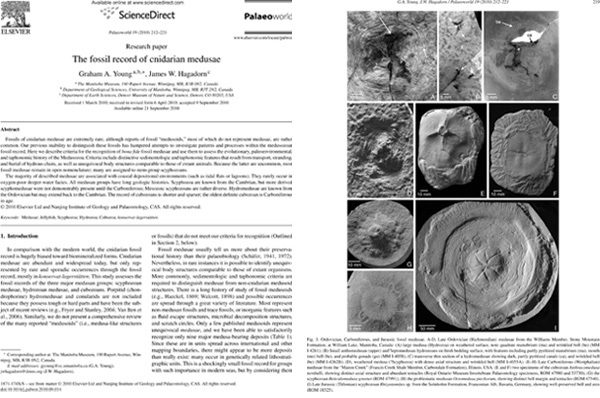 Our review of Ordovician Konservat-Lagerstätten in Manitoba was published in Geoscience Canada (2012, volume 39, number 4, published in February, 2013). This was a group effort (Young, Rudkin, Dobrzanski, Robson, Cuggy, Demski, and Thompson), providing a status report on many years of field collecting and study. Great Canadian Lagerstätten 3. Late Ordovician Konservat- Lagerstätten in Manitoba. If you don’t want to download the paper but would like to read about how to recognize fossil jellyfish, take a look at this blog post. The Ordovician diversification didn’t only affect organisms with hard skeletons. Important information about Ordovician biodiversity is also hidden in the sparse soft tissue record. Ordovician lagerstätten are rare globally, particularly in comparison with the Cambrian. Manitoba has least three Ordovician sites with preserved soft tissue: at Cat Head, Airport Cove, and William Lake. Ongoing studies at these sites will significantly enhance our understanding of global Ordovician biodiversity. The Cat Head, of early Maysvillian age, is significantly older than the other two, which are considered to be Richmondian. Depositional environments also differ: the William Lake and Airport Cove biotas represent restricted marginal marine conditions, while the Cat Head was probably deeper water.